Beat This Caption Contest 137 Winner – Caption Contest Funny Clever Witty Enter Today! Channel Eleven, or Ellen Show? 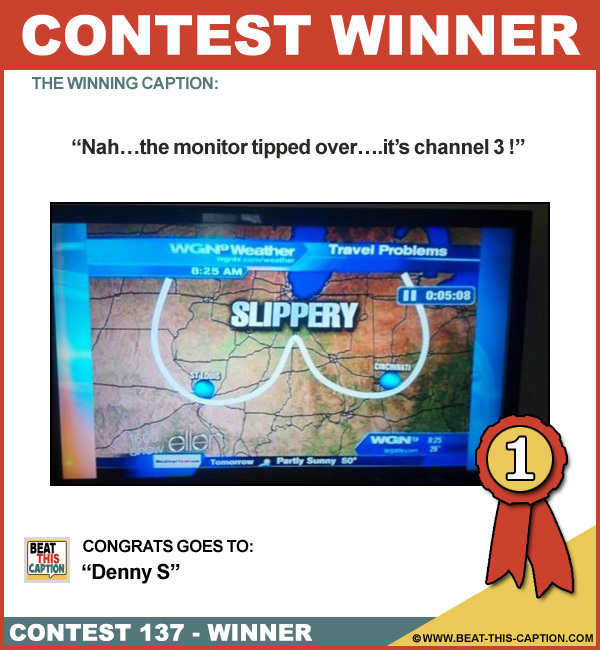 Nah…the monitor tipped over….it’s channel 3 ! LOL Can someone knock over my Kickstand? ha! Great Caption! :) You WIN! This is why Betty White is so Hot In Cincinnati! …and what we have here folks, is a cold front, working it’s way into Tittsburgh! This just in, the stock market plunged by 40DD! I’d like to see the Hurricane going on down South! When I was a kid, we didn’t have remote control, we just had to play with the knobs! Meteorologists say a warm front is coming! The hurricane seems to be traveling towards Hooterville!